Bond king Jeffrey Gundlach warns that stocks could be in trouble. And last week ended with interest rates triggering a sell signal in the stock market, under his view. He believes higher interest rates are bearish for stocks. Specifically, he said if the 10-year treasury yield rises above 2.63%, it could start to hurt equities. On Friday, the 10-year treasury rate was at 2.64%. But, as the chart below shows, 5% is more significant for stocks. 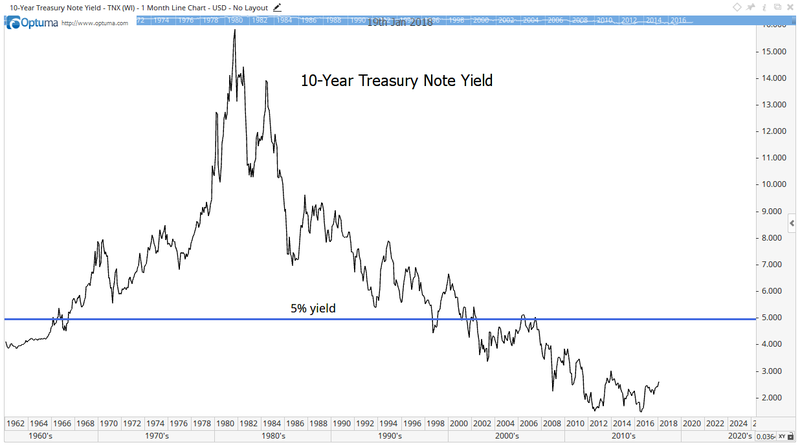 Long-term investors remember when 5% was a low yield on 10-year Treasuries. The rate was above that level from 1967 until 2002. And stocks gained more than 1,000% over that time. It’s just unlikely 2.63% is too high. Individual investors don’t really track interest rates to the one-hundredth of a percentage point anyway. They think in round numbers. The 5% level is where rates become attractive to stock market investors. That’s where investors believe they get a decent return on bonds, and that’s where stocks will struggle. Gundlach is a great investor. He’s the CEO of DoubleLine Capital. His firm manages about $119 billion in assets, and he consistently ranks among the top performers. And he is getting headlines for saying 2.63% is the important level. But he acknowledged that stocks are likely to move much higher before they fall. Investors need to remember that now is the time to benefit from the rally instead of worrying about a decline. Editor’s Note: After spending more than five years developing and testing his strategy, renowned natural resources expert Matt Badiali is going to share his best research from it in a new VIP trading service. And he’s guaranteeing that anyone who joins his new service will have the opportunity to turn $10,000 into $100,000 within 12 months. After all, there are plenty of huge, life-changing opportunities taking place in the natural resource sector right now, and everyone should have the chance to take advantage of them. To find out how Matt’s stock recommendations have the potential to capture such incredible gains, click here to sign up for his exclusive webinar presentation.